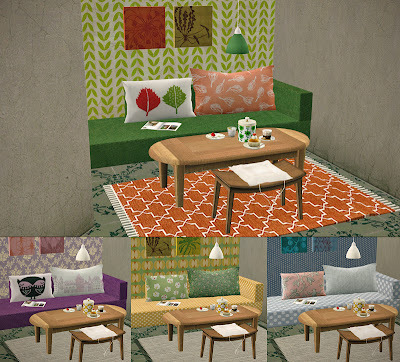 4 recolors of this nice Simply Styling couch. Hello, my name is Grazy and I live in Brazil. I always read your blog because I love your downloads for The Sims 2. I also love your things retro, bags and accessories. Here in Brazil is very difficult to find things in such a good time to use. I hope we can communicate:). I've just found your site and I adore your creations. Thank you so much for your hard work! Hi, there are several of us at Black Pearl Sims who saw a pic of yours here , it has open window, table & chair, and a clear glass bowl with green salad in it--we are going crazy to find out where we can get that bowl? It is on the first page of your blog home page here. If you recall and have the time, could you please help us? http://123etfportfolio.blogspot.com/ The BEST ETF website EVER!!!!!!!!!!!! !